You are here: Home / News / C. Vivian Stringer’s rightful place on the Mount Rushmore of women’s college basketball. C. Vivian Stringer’s rightful place on the Mount Rushmore of women’s college basketball. (ThyBlackMan.com) The first two head coaches that come to mind when women’s college basketball is brought up are the late Pat Summitt of Tennessee and Connecticut’s Geno Auriemma. They built powerhouse programs and featured many of the nation’s most talented teams on an annual basis while building a rivalry that helped grow the sport. There are also other major figures in women’s college basketball including Tara VanDerveer and Sylvia Hatchell. Auriemma, Summitt, VanDerveer, and Hatchell all have similarities and differences between them but one thing that they all have in common is that they all have won over 1,000 wins as a Division I women’s basketball coach. There is now a new member of the 1,000 win club as Rutgers head coach C. Vivian Stringer has joined them after her team defeated Central Connecticut State earlier this month. There is no disputing the greatness or impact that C. Vivian Stringer has had on women’s college basketball. Her head coaching experience began with Cheyney University, the country’s oldest historically black college, as she led them to the first NCAA women’s basketball championship game ever in 1982, which Cheyney lost to Louisiana Tech. It is very important to note that Stringer’s work with Cheyney was pre-Title IX so her duties as a women’s head basketball coach far exceeded Xs and Os and recruiting. Her challenges were compounded by being a black female head coach of a woman’s sport at a HBCU. Also, Cheyney struggled financially to send the team to the 1982 Final Four in Norfolk, Virginia. After moving to coach the University of Iowa, C. Vivian Stringer faced both highs and very difficult and challenging lows. She led the team to nine NCAA tournament appearances including a trip to the 1993 Final Four but the most difficult part of that season was the sudden death of her husband, Bill Stringer, to a heart attack the day before Thanksgiving in 1992. After a successful stint at Iowa, Stringer became the head coach at Rutgers in 1995. It is her tenure at Rutgers where Stringer has become most known for. 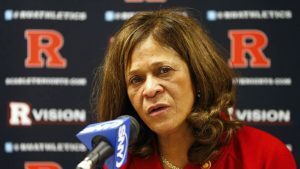 The Rutgers women’s basketball teams under C. Vivian Stringer have been a mixture of toughness, talent, and work ethic. She has guided them to multiple Big East Regular Season Championships back when Rutgers played in the Big East, two Final Four appearances, and a berth in the 2007 Women’s National Championship Game. Despite her incredible coaching accomplishments, Stringer gained national attention for her handling of the racist, sexist remarks by radio host Don Imus in 2007. She handled a difficult situation with grace, class, and displayed the type of role model that she has been known for being. Her Rutgers program has produced both WNBA stars like Cappie Pondexter and Essence Carson and successful young women in society. If there is an imaginary Mount Rushmore of women’s college basketball coaches, Pat Summitt and Geno Auriemma are easily on it but C. Vivian Stringer should be one of the faces as well. She doesn’t have a national championship but she was the first man or woman to ever to lead three men’s or women’s college basketball teams to the Final Four. Only Pat Summitt has more 20 win seasons by a women’s college basketball head coach. She also has a legacy as a role model as the only black coach and black female coach in that 1,000 win club and she opened the door for many black women in sports including Dawn Staley and Carolyn Peck, the only two black women to win national championships in women’s basketball. In a sport that thrives on having black women succeed as players, few people can come close to the success of C. Vivian Stringer.